On 4th Feburary 2015, Palando published the Maximilianeum at Planet Minecraft. The project page was visited often enough to catapult it to the so-called "pop reel" which showcases the most popular projects. Link to the project: Click me! 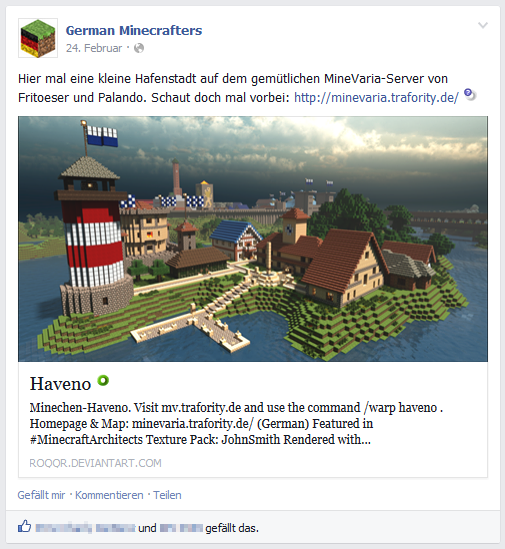 On 24th February 2014, the young Facebook page German Minecrafters linked to a rendered picture of Haveno on DeviantArt, together with a short description and a link to our homepage. We were mentioned by this page a second time on the 17th September 2014. 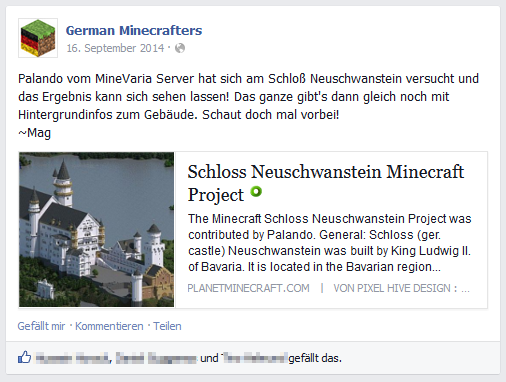 This time, they drew attention to Neuschwanstein Castle and its project page at Planet Minecraft.